Our Maths focus this week was Roman Numerals, a topic which the children really took to and enjoyed. 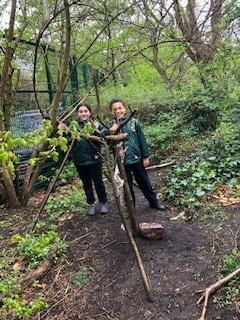 We tied this in with learning about the Stations of the Cross in RE which culminated in our poignant assembly which retold the story of Jesus crucifixion. In English we used comparative conjunctions in our writing to compare Stormbreaker the book with the film. Perhaps the highlight of the week was the eagerly anticipated parachute competition which rounded off our air resistance Science lessons. Finally we were so impressed with the artistry and creativity of the children's Easter bonnets. Stations of the Cross with Father Jeff, Assembly, Forest Schools and Easter Bonnet Parade! It really has been an incredible week for Violet 3. In English, we finished our very informative non-chronological reports about the Mayan Civilization and in Maths we revised Ratio and Proportion word problems. In Science we had a go at drawing the correct symbols to create a circuit. Can you remember the two different symbols for a bulb? 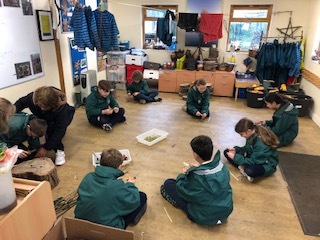 We had an absolute blast at forest schools, running around exploring, building dens and using tools to whittle hazelnut branches. It was fantastic!! Violet 3 definitely deserves a restful Easter Holiday. But remember on the first day back we are off to the National Gallery!